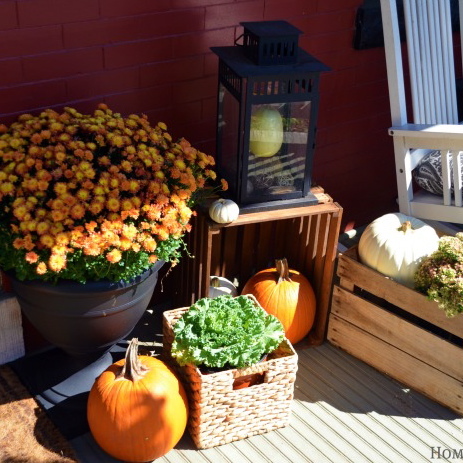 Welcome to this year’s urban farmhouse fall porch! 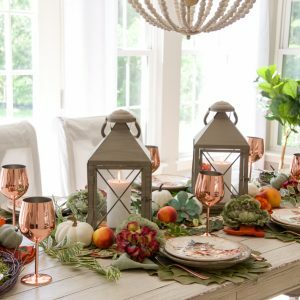 I live in a row home in the city and love a cottage farmhouse look. 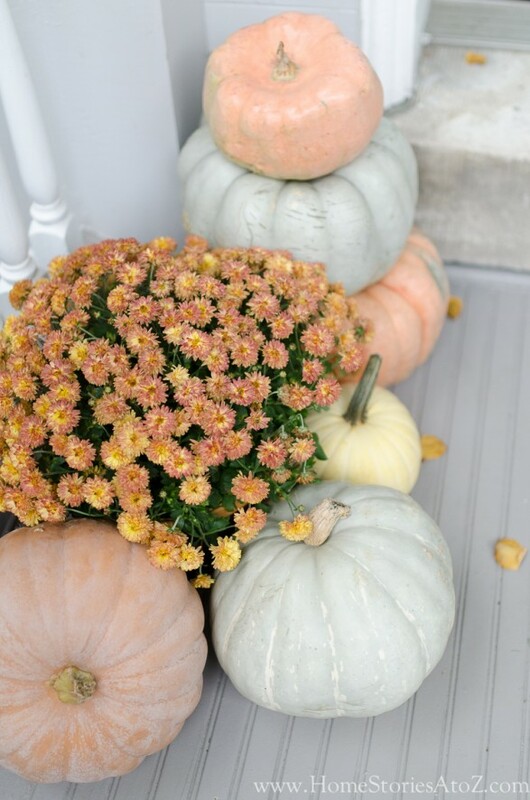 My porch is such a fun backdrop to play around with, and I enjoy coming up with fresh looks each season. 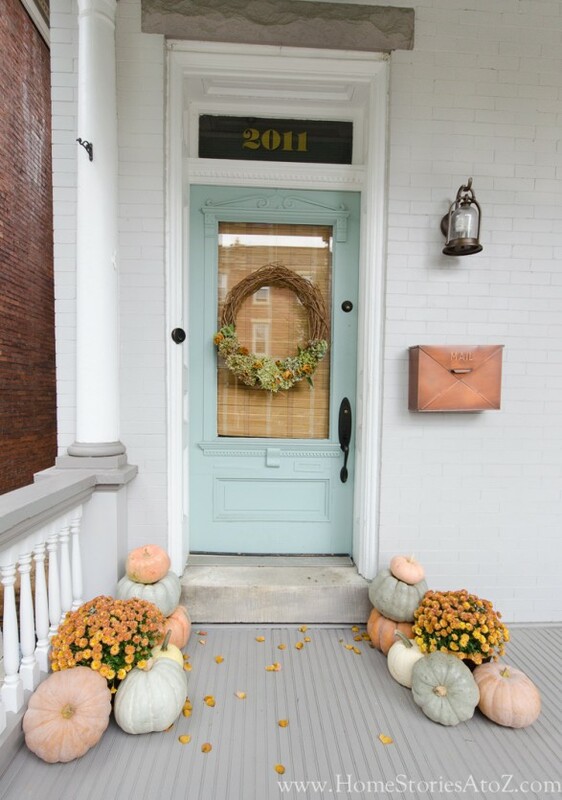 You can find all of the paint colors for the porch here if you’d like. 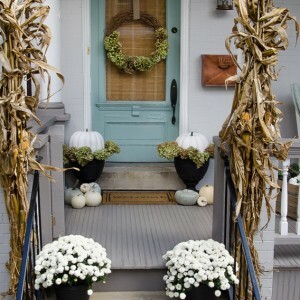 Last year, I went all out for my fall porch, so this year I thought I’d scale it back a bit and just focus on the front door area. Yesterday, I ran to Lowe’s to pick up some mums and oh-my-goodness! There was nary a mum to be found and Christmas-everything had overtaken the place. 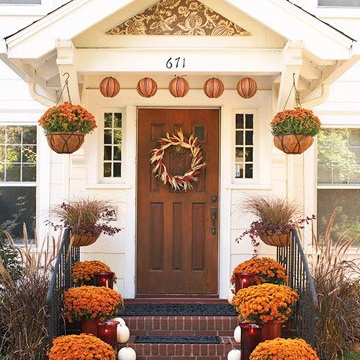 I know we all complain that retailers begin putting out Christmas decorations earlier and earlier every year, but people should still be able to shop for decent mums in mid-October. :-/ I was grateful to find these mums in the perfect color at 50% off! My peach and blue cinderella pumpkins were a lot harder to find this year. I had to drive to a market about 45 minutes away to hunt them down! Aren’t they just gorgeous? I love their muted colors. 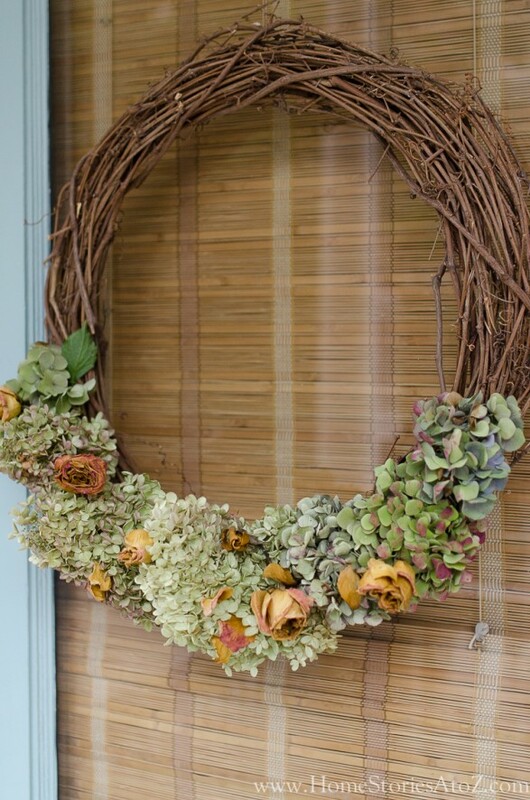 For my door, I stuck some dried hydrangea stems into the wreath and then grabbed some dried roses that I hadn’t gotten around to tossing yet and stuck those in there too. I’m so glad I hadn’t thrown them out because they offered the perfect touch of peachy-orange that I needed! 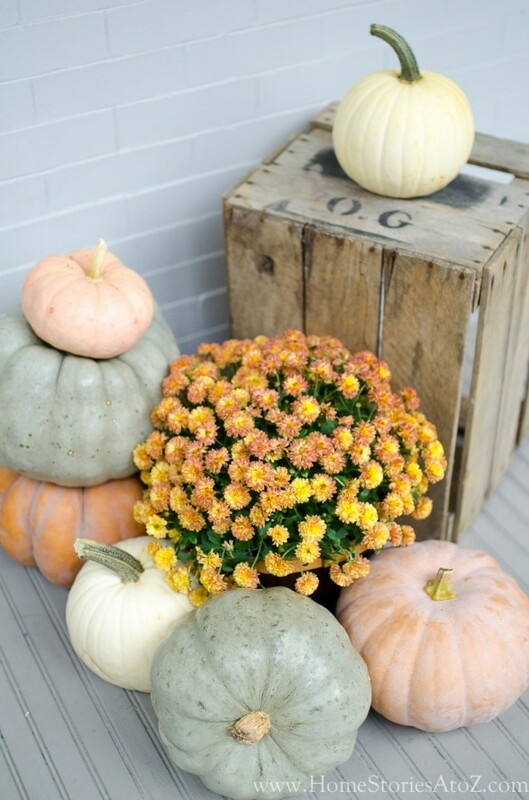 The pumpkin topiaries are made by simply stacking the pumpkins on top of each other. 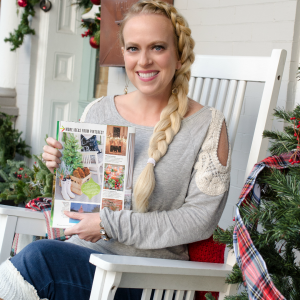 I had originally thought of putting them on top of hay bales, but then I remembered the year I had hay bales on the porch and I quickly decided against it! Hay bales tend to get mildewy when wet and they can really make a mess of your porch. They look so great though! This grocery store fruit crate has served me so well over the years as an accessory! I wish I had several more just like it. 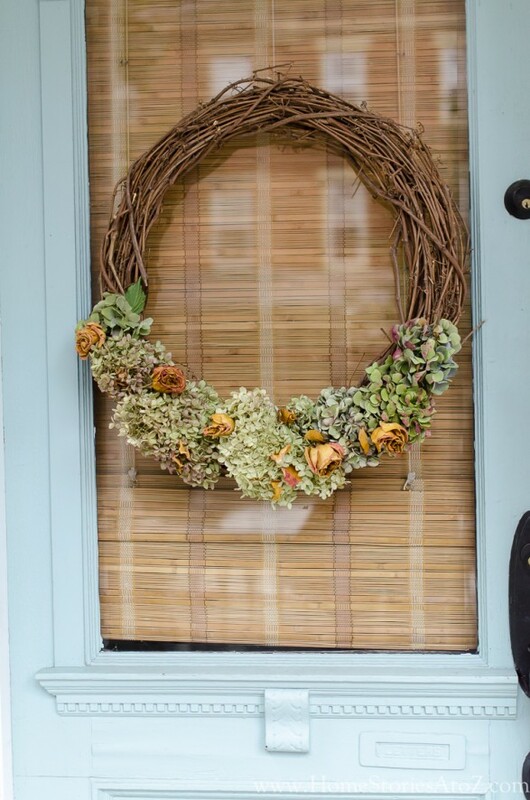 I’m often asked how I hang my wreaths on the door. I don’t typically use door hangers because I don’t like the look of them. 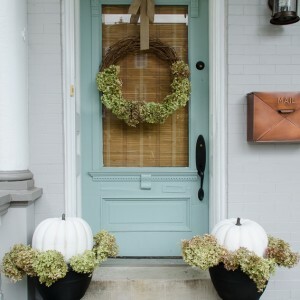 I have one significant nail at the top of the door, and I either use fishline or ribbon to attach the wreath to the nail. 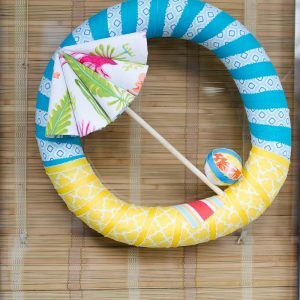 Fishline is great for more ornate wreaths. 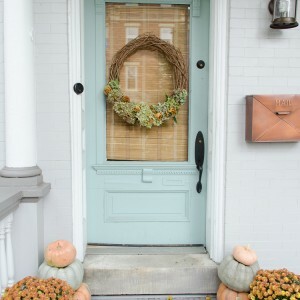 Sometimes a ribbon can make your look “overly busy” and a loop of tied off fishline disappears nicely against the door and gives your wreath a “floating” appearance. 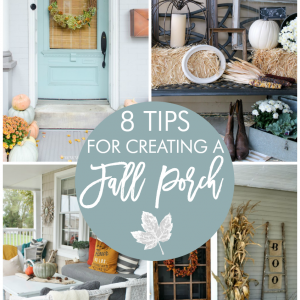 Thanks so much for stopping by and checking out my fall front porch! If you liked this post, you might enjoy some of the related posts below as well! You can also find me on Instagram where I share sneak peeks, mini-blog posts, and additional content not shared on my blog. I’d love to see you there! If you love my mailbox, I found it on Amazon*! 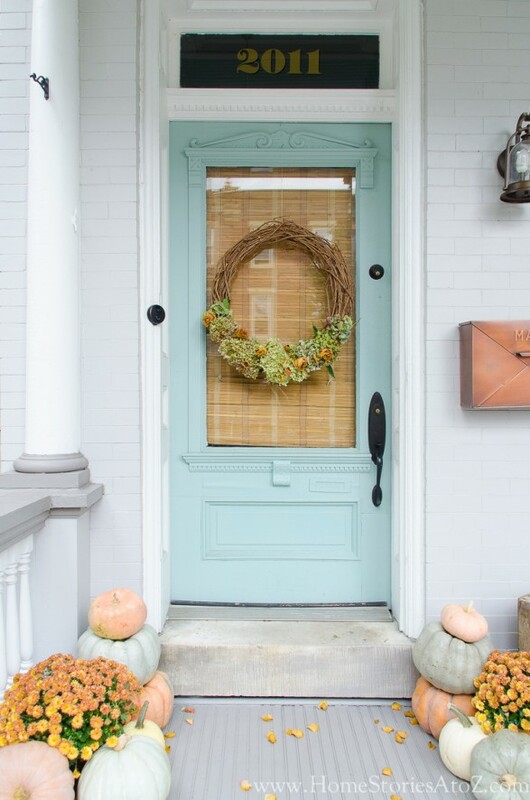 Love love love your front door. 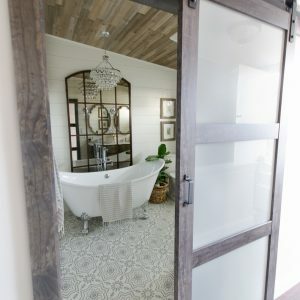 I want to have my door guy make your exact door. Can you send me up close pictures of your door? Hi, your home is beautiful! We have an old home in the downtown area of where we live and are painting the exterior. Do you know the name of the color of your door. It’s exactly what I’ve been looking for! Just so hard to tell when actually picking it out! 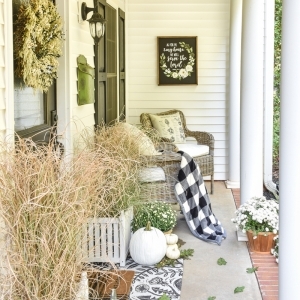 Hi, beautiful porch! Where did you get the door?!!! I love it!! Your choices in everything I have seen here are well thought out, very attractive, and very functional! Delightful! I really like every aspect of your site/blog. I t is the best I have come across through Pinterest postings, actually. I would enjoy following you and your lovely ideas. Thank you for sharing your lovely home and great ideas and accomplishments! Your decorations are beautiful. 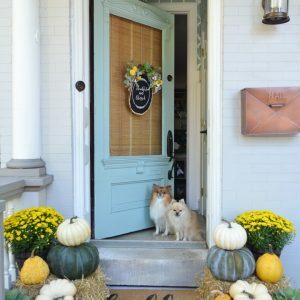 There is a classy look to your porch and the colours are gorgeous. 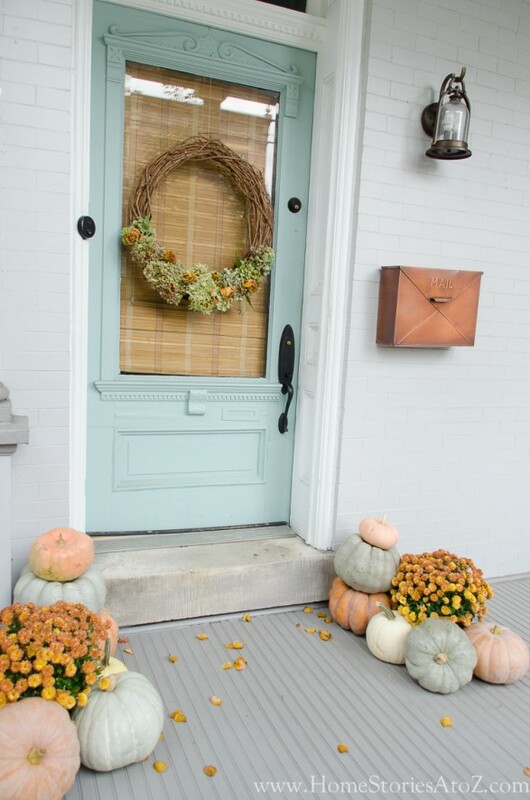 If we had a porch this is the way I would like it to look.